A short biography of the Italian anarchist, Gino Lucetti, who tried to assassinate the world’s first fascist dictator, Benito Mussolini, in 1926. 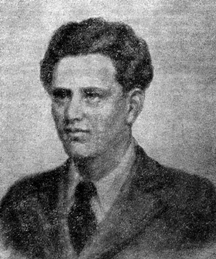 Born in 1900 in the anarchist stronghold of Carrara, Gino Lucetti had a highly individualistic outlook compared to many of his more anarchist-communist comrades. He was an outstanding figure of local – and indeed nationwide – anti-fascism. Many of those who knew him remember him continually in thought, with a book under his arm, strolling along the riverbank. Of working-class background, he was virtually self-taught and on the basis of this self-procured education he took part in the political struggles of the 1920’s, which culminated in the 1920 factory occupations, confronting the fascists on many occasions. There the assassination attempt on Mussolini’s life that was to make him famous – albeit hard up – was planned, and he returned to Italy and Rome there to make his attentat on 11 September 1926. When his attempt failed, he was arrested, tried and sentenced to 30 years’ imprisonment. Two others, held to have been his accomplices, Leandro Sorio and Stefano Vatteroni were sentenced to 20 years and 19 years 9 months respectively. Lucetti was held in the Santo Stefano prison where he spent nearly 17 years before being moved to Ischia where he died on 15 September 1943, according to some sources in a US air raid. Others claim (and among them was Mauro Cacuma who went to recover the body and picked up information on the spot) that the shells that killed him had been fired by the Germans who were still in occupation of Procida, nearby. Many years later, the Communist Party newspaper L’Unita carried a piece in which it was claimed on the basis of testimony by one of Lucetti’s fellow inmates that Gino Lucetti had become a Communist in his later years. The Carrara anarchists adamantly deny this and are supported by the testimony of Lucetti’ s brother and his fiancée who visited him right up to the end. He is buried in Carrara with many other anarchists, including Goliardo Fiaschi and the Milanese Giuseppe Pinelli who was thrown from the window of a police station during the Strategy of Tension, and immortalised in Dario Fo’s play Accidental Death of and Anarchist. His name was taken up by the “Gino Lucetti Battalion”, a group of anarchist partisans who assisted the liberation of Italy from the fascists towards the end of World War II.